I've been back in Rotterdam, NL for the past 6 weeks getting back into the swing of things with my club Door Neptunus. For those of you who don't know about European baseball, every country has a league, all have different names, and Holland and Italy are the top 2 baseball caliber wise. 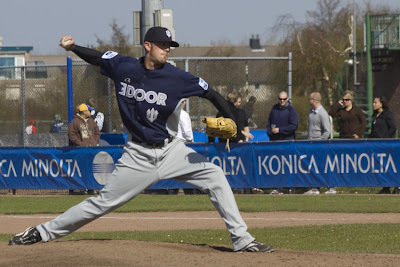 This is my 3rd season playing for Door Neptunus in the Dutch 'Hoofdklasse' out of the past 4 years. This year, like I said, we are stacked. Tons of talent, and so far, we're putting it to use. 3 of our 4 outfielders are on the national team, 4 of our 6 infielders are, and 3 of 4 starting pitchers are (the other is on the Australian national team). Oh, and our main catcher had to retire from the Oranje (national team) because of work issues. So, yeah... we have kicked off this season at a 16-1 mark so far. We have played well, played hard, had to battle for a few wins, but most of all have played good, fun baseball. I don't think I've bloged about my release, but it wasn't anything special. Here's the story in a nutshell. There were a couple reasons why the Jays came to their decision to release me. First off, something I didn't see coming even though I knew it was going happen, happened. When the Jays traded Roy Halladay, their ace for the past 10 years, they didn't get a big league pitcher in return, only a couple minor league hitters and a minor league pitcher. Because he left, the starting rotation for the Jays was very weak, so they ended up signing about 20 triple-A caliber pitchers, and a few big league guys too, which is the part I didn't see coming. When those guys don't make the big league team out of spring training, they get shuffled down the system, as do all the pitchers below them because of that. I was in the unfortunate spot in double-A where there were 3-4 higher end bullpen prospects coming up from single-A, forming a bit of a pinch of the non-prospect double-A guys. It's kind of hard to explain, but teams take care of guys they have money invested in, and I wasn't one of those guys, after signing for 0$ just to get my shot. They have released all the guys that I was in the bullpen with last year now, except a couple of the prospects who came up later in the season. On the other hand, my walk total hurt me too. Throwing submarine wasn't my cup of tea, I could do it, but struggled mightily to hit the zone every time. My ERA wasn't bad for the minors, but again, my walk total hurt that. I gave up an average of 1 hit per inning which is, decent, and my strikeout total was decent, but I was in there to get groundballs, and I knew that. Well I guess that wasn't really in a nutshell, but it's a bit of a intricate story I guess. It's all good though, I am happy to be where I'm at now, having fun with the boys back here, and I get the opportunity to play in 3 tournaments this summer and fall with the national team which is important to me. this weekend we play Ado, a team from Den Haag, or 'the Hague', and I have the start on Sunday. Should be a good weekend, but we gotta come out ready! At least there is teamspirit now, not just individual effort. Will be fun to see you in action with the National team in July! Loved your photos of Rotterdam ... thanks for the "Wilhelmina pier" planter, and yes, I was born only about 15 min. away from that location. Glad to hear you are making out okay. So I'm guessing you went back to your old throwing style? I am a big baseball fan from Hungary. I was in the Netherlands a few times, I watched the World Port Tournament, Honkbalweek, many times. My favourite team is Oranje, because you are the ambassadors of european baseball in the World. 1. Greetings to the australian guy, Dushan, from Hungary. 2. Good luck to the European Cup! We will be in Brno at the other location. 3. See you in Germany! Excellent blog. Glad to see your team is doing well and you are enjoying being back in Holland, although I must say I was looking forward in returning to Manchester to see you play there. Gig and I really enjoyed it last year. But, all things are meant to happen. It may turn out for the better. You never know. I will look for updates on your blog from time to time. Leon, have you found that the work you did in the offseason is paying dividends in your performance this season? Callum, Yes. I am a firm believer that you get out what you put in. And even this season, I have been working my tail off, and so far have been getting out what I've been putting in. This past offseason was very important, I needed to find my old mechanics again, and am still in search of my perfect old mechanics, but am not far off!